The Korea Herald runs some pretty fantastic graphic news photos. This one not so fantastic. Getting on the roads in Korea as a cyclist, pedestrian or driver is a bit of a leap of faith as people seem to be always pressed for time, and not taking into account they are essentially driving a ground missile. To be fair, I never felt too safe on American roads either, especially as a cyclist (e.g. beer can thrown out of a moving truck at me). 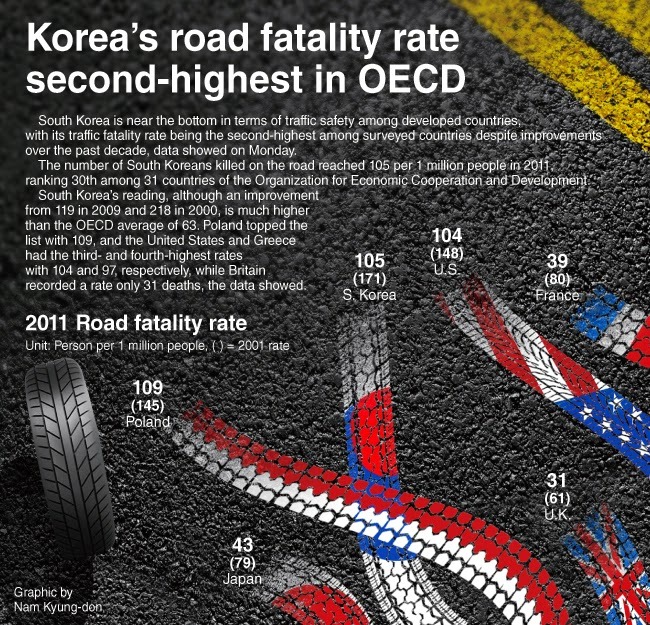 Now I see why, as America is just one fatality per 1 million people behind South Korea. The takeaway? Get off your phone. Slow down. Your life would be ruined by adding to this statistic and only mildly affected by being late to whatever you are rushing to.